Sound familiar? That’s a line from the introductory song to Schoolhouse Rock!, an educational cartoon series beloved by millions of students. 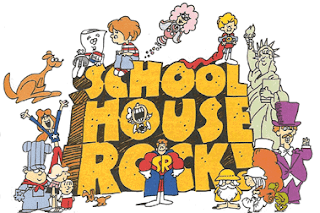 Believe it or not, this year Schoolhouse Rock! celebrates its fortieth anniversary! The sixty Schoolhouse Rock! videos cover topics as varied as math, grammar, science, American history, economics, and geology. In approximately three minutes, each pairs informative lyrics with a catchy beat to help students with tasks like differentiating between parts of speech, reciting the multiples of three, or understanding how a bill becomes a law. Despite their age, the videos are still used in some classrooms. Teachers find that students enjoy the fun, goofy videos, and they’re often able to recall important information more easily when it comes in the form of song lyrics. Yes, Schoolhouse Rock! is dated, but that’s part of its charm. So invite your kids along for the ride as you unpack your adjectives, visit Conjunction Junction, and bring Interplanet Janet (from the days when Pluto was still a planet! ), Mr. Morton, and Rufus Xavier Sarsaparilla to your celebration of this rockin’ anniversary!